The thought of sending the same email every Monday can be time-consuming and totally frustrating. To save time, most people end up copy-pasting the previous email into the message. And that’s where the challenge is. While that technique might work, you are prone to making mistakes. You don’t want to forget to write or send the email bearing a different subject line from the one you intended. Instead, you may create an email template that you can use more efficiently. Just like the Gmail Canned Response feature, you can use Microsoft Outlook Email Template feature so that you can easily create predefined email templates ideal for responding to or sending those ‘routine’ emails. Only a few people know about this powerful feature which is free email templates for outlook, and how it can help solve the mystery of sending those perfect repetitive emails without forgetting the little bits. 3: Where is the default Outlook Email Template Folder located? Instead of copying and pasting your previous messages or sending the same text over and over again, you can create a template in outlook that takes care of that. How can you get started? Step 3: Once the Save as windows pops up, look for Outlook Template in the Save as a list and click Save. Your outlook email templates will have “to” and “cc” fields. Unless you want to send the email to specific persons, don’t worry about entering any addresses. Write a relevant subject line which can help you identify that email template. Fill in the body of the email just how you want. 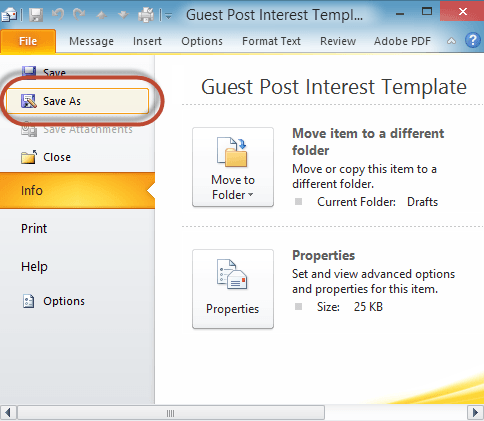 Once you are through, you can give your template a name and select Save and exit of out of your draft email. you can create email template outlook 2016 in the same way. Create Free Templates with SalesHandy! Open Outlook and click the pull-down arrow next to New items. You should be able to see the name of the template you created. Select it and click “Open”. Based on the template of your choice, you will have a new message carrying the same subject lines, message, and images and formatting. If you want to use it, you will only need to make additions to the “TO,” “CC” and “Bcc” boxes. Also, you can easily change the body text and subject lines used in the previous messages. The good thing about it all is that the changes you will be making won’t be saved in the template. Once you have satisfactorily verified the message, click Send. And there you go. 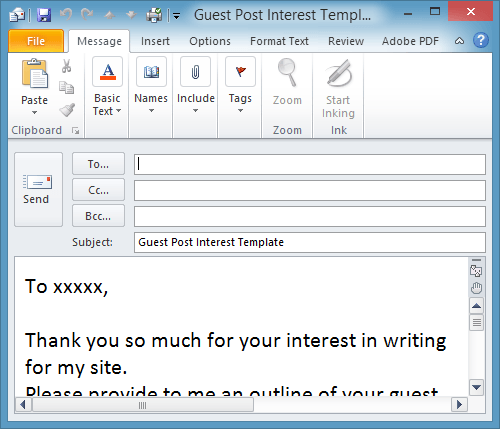 Open an existing Outlook Email Template as per the steps above. Once you are good to go, saving the template using the same name will “overwrite” the existing template with your new changes. Where is the default Outlook Email Template Folder located? If you frequently use Outlook Email Templates, you might want to know how you can access them without much hassle. If you can remember folder path that contains the templates, type %AppData%\Microsoft\Templates in the search bar of the file Explorer and press Enter key. This works for Windows Vista, 7, 8 and 10. If you are still using the old-soul Windows XP, here is the path to the folder: c:\documents and settings\username\application data\microsoft\templates. 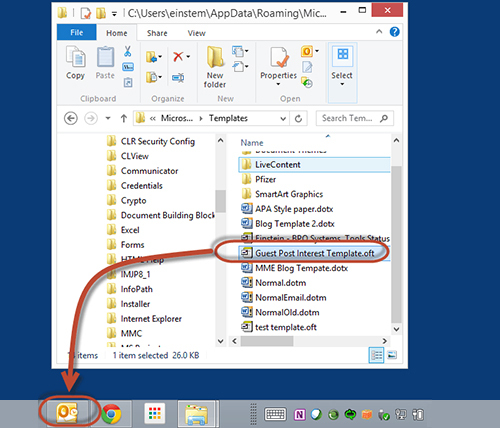 However, if you don’t want to go through the hassle of locating and opening your templates, you can create a shortcut by “pinning” the template folder on the taskbar. So that next time you want to launch the Outlook Email Template, you just need to “right-click” the Outlook icon pinned on the taskbar. Every business wants to run a professional campaign that doesn’t raise eyebrows from the customers. Thus they want their emails to look elegant across all email clients. However, versions of Outlook from Outlook 2007 onwards seem to betray the hard work most people put into designing emails. Because Outlook uses Microsoft Word to render HTML in the emails, there is always a problem with how emails are displayed to the recipient(s). Other challenges with Outlook emails include extra white space in the content and a possibility of clipping, rescaling or failing to load the image. And what could the results be? The end recipient will get a “poorly designed email” that might harm you or your business’s reputation. Unlike with Outlook Email Template, you can use SalesHandy to design powerful custom email templates for your business and send it to Outlook email. SalesHandy’s templates remove all the redundancies saving you time while giving you a host of other powerful features. So you can easily mail merge, add attachments, send and track document and link open with ease. Step 1: Sign up for up for SalesHandy. Step 2: Navigate to templates. Step 4: compose the title, subject, and content of your template and click on create. A fully sharable template will be created that you can use everywhere, i.e., in your campaigns, emails, etc. The created template can not only be used directly in Gmail and Outlook, but it also gives you reports and other insights you might need when running campaigns. Make Your Emails Standout with SalesHandy! Sending a repetitive email can be a tiring process, you can create a template that you can always edit in case you need to fire off another ‘routine’ email. 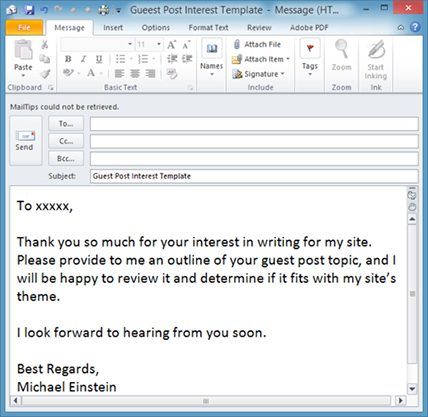 Outlook Email Template helps you creating such a template. Although, SalesHandy helps you create powerful templates that come with more functionality, unlike free email platforms. Also, Know how to send automatic emails in outlook?